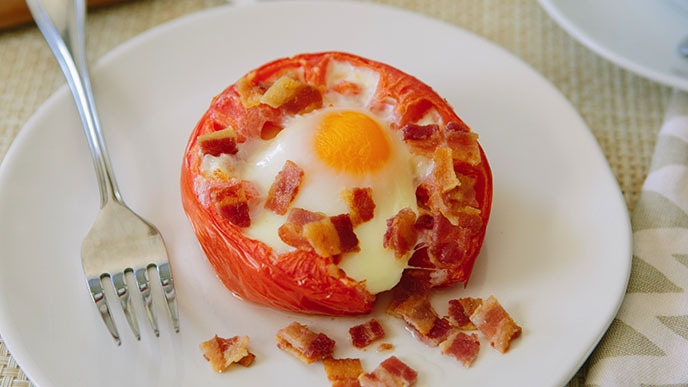 Home » Breakfast recipes » EGGS » OVEN POACHED EGGS !! poaching eggs in the oven and I was quite intrigued. Not only can poaching eggs, in the traditional method, be a disaster be challenging but you can only make 2-3 at a time!! The video said to put about a tablespoon of water in each cup of a regular muffin pan, then crack an egg over the water and bake at 350° for 8 to 10 minutes.........well, that ALMOST worked. 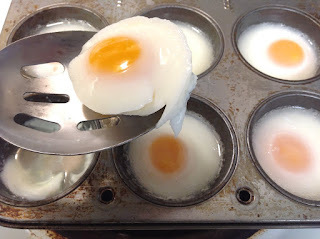 I DID use the scant tablespoon of water, and I DID preheat my electric oven to 350°, but when I tried it using a standard cupcake (muffin) pan, the egg + water filled it to overflowing and took a full 20 minutes to cook, not 8 to 10.
and they lifted right out of the pan with a spoon.....YUM!!! A PERFECTLY POACHED EGG !! Whether you are making one or 30, this method (with my tweaks) really does work and it couldn't be easier!! The difference in cooking time (between my oven and the Foodstyle video) COULD be that their oven simply runs hotter than mine or maybe they were using smaller eggs (? )With so many variables, I suggest you do a "test egg" to see how long it takes in your oven before you make a whole pan of these. One other note: When your eggs are done to your liking, take them OUT OF THE PAN right away or they will continue to cook. dunk your toast in this one?